Kennedy Sabharwal is awarded the 2016 Outstanding Youth in Philanthropy Award from the Association of Fundraising Professionals (AFP) Bluegrass Chapter and the University of Kentucky Thoroughbred Collegiate Chapter. Each year, AFP gives tribute to those who give their time, talent and financial support to enhance and improve the quality of life in our local commmunities and beyond. The purpose of the Outstanding Youth in Philanthropy Award is to recognize high school students who have demonstrated an outstanding commitment to the community through raising direct financial support, development of charitable programs, volunteering, and/or leadership in service and philanthropy. In 2007, Kennedy Sabharwal created Project Redlight, a non-profit organization that provides books and videos to sick children in hospitals throughout the state of Kentucky in order to diminish boredom. The idea came after a friend passed away from cancer talked about how bored he was during his hospital stays. Kennedy began putting together a plan for friends and family members to help her collect gently used and new books and videos. Her initial goal was to fill six rolling book carts. Help soon came from her brother and other family members. Donation drives were held at her school, church and even encouraged as birthday gifts for parties in lieu of presents. 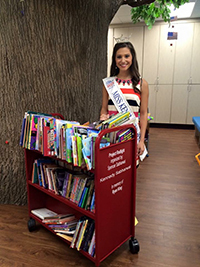 To date, Kennedy has delivered over 4,000 books and videos to many area hospitals across the state. The great thing about this project was that once the carts were purchased the books were donated making for a minimal start-up budget. The best part of Project Redlight is that Kennedy’s entire community has joined to assist her with this endeavor simply by donating books and organizing book drives. The children at local hospitals are the clear beneficiaries of Project Redlight, but those who donate also benefit from the value of helping others through this wonderful opportunity of community services. The number of volunteers and the people served is enormous. Hundreds of children have donated books as well as a countless number of volunteers have also helped. Book carts were placed in the following hospitals: Baptist Health (Lexington), University of Kentucky (Lexington), Ephraim McDowell Regional Medical Center (Danville), Casey County Hospital (Liberty), and Fort Logan Hospital (Stanford). 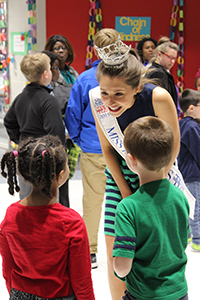 Book drives were organized by the Liberty First Christian Church Christian Women’s Fellowship, groups from The Lexington School, Miss Kentucky Contestants and hundreds of volunteers from local hospitals.